This list, arranged by date, contains basic bibliographic data on the books I have collected, plus a very brief description of the radiosonde-related content. I’ve used the authors’ spellings of radiosonde, radio-sonde, etc. These are all actual books of the vintage shown in each entry. They are not digital editions nor modern print-on-demand versions of books with lapsed copyright. If you need additional information or would like any of the content scanned, please contact me. 1863 An Account of Meteorological and Physical Observations Made in Five Balloon Ascents in the Year 1863 British Association for the Advancement of Science James Glaisher, F.R.S. &c 90 Detailed observations made during the manned ascents, which ranged in peak altitude from 6,600 to 24,000 feet. 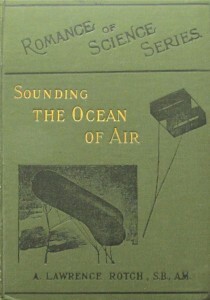 1900 Sounding the Ocean of Air Society for Promoting Christian Knowledge A. Lawrence Rotch 184 plus endpapers Chapter on "ballons-sondes" with drawings and charts. 1901 The Story of the Atmosphere George Newnes, LTD. Douglas Archibald 210 Mentions use of "self-recording thermographs" with "captive or free balloons" and summarizes history of ballooning. 1902 Observations and Investigations made at the Blue Hill Meteorological Observatory . . . 1899, 1900. Observatory of Harvard College A. Lawrence Rotch, Director, S. P. Fergusson, writer. 239 plus end plates Discussing the "investigation of the air" with kite-meteorographs to an altitude of 14,060 feet. Detailed descriptions and line drawings of the Richard's meteorograph and others. 1904 The Story of the Earth's Atmosphere D. Appleton & Co. Douglas Archibald 194 Highest successful balloon ascent of man to 30,000 feet in 1894; "no navigable balloon will ever be able to stem the currents above 5,000 feet." Also have 1897 ed. printed by George Newnes, Ltd.
1908 Harmsworth's Universal Encyclopedia Froude-Holmes A. Hammerton ed. -- Clip from encyclopedia showing Richard's meteorograph in cage for ascension beneath kite or balloon. 1909 The Conquest of the Air or the Advent of Aerial Navigation Moffat, Yard and Company A. Lawrence Rotch 192 Photo of ballon-sonde ascending and discussion of the tropopause temp reversals measured by ballons-sonde ascensions (begun by French in 1893). 1996 hardcover reprint. 1912 Meteorology The MacMillan Company William Isbister Milham 549 plus charts Discussion of kite and balloon-borne meteorographs, with photographs. Also have a copy of the 1927 edition. 1916 The Weather Map His Majesty's Stationery Office Sir Napier Shaw, Director of the Meteorological Office 94 Discussion of the use of "balloons, BALLONS-SONDES and PILOT BALLOONS for the study of the upper air." Chart showing troposphere and highest "BALLON-SONDE" flight (22 miles). 1917 The Aviator and the Weather Bureau San Diego Chamber of Commerce Ford A. Carpenter 54 Discussion of 1913 two-balloon meteorograph ascents to 94,716 feet, with low temp at 49,960 feet. (With photos). 1917 The Principles of Aerography Rand McNally Alexander McAdie 318 Contains a history of discovery of tropopause. Inscribed by author and wife to the wife of Professor A. Lawrence Rotch, founder of Blue Hill Observatory. 1919 Meteorology for All, Being Some Weather Problems Explained Witherby & Co. Donald W. Horner 184 Detailed discussion and drawings of the Dines balloon meteorograph. Two copies. 1920 Meteorology Methuen & Co. Ltd. R. G. K. Lempfert 186 plus endpapers Writes of use of anemometer carried under pilot balloons and stratospheric characterization by means of "ascents." Two copies. 1920 Australian Meteorology Oxford University Press Griffith Taylor 312 Photo-plate of 1915 Dine’s meteorograph launch and diagrams of device. Also chart showing highest “ballon sonde” flight (35 km). Movable “solar-control” model inside front cover. 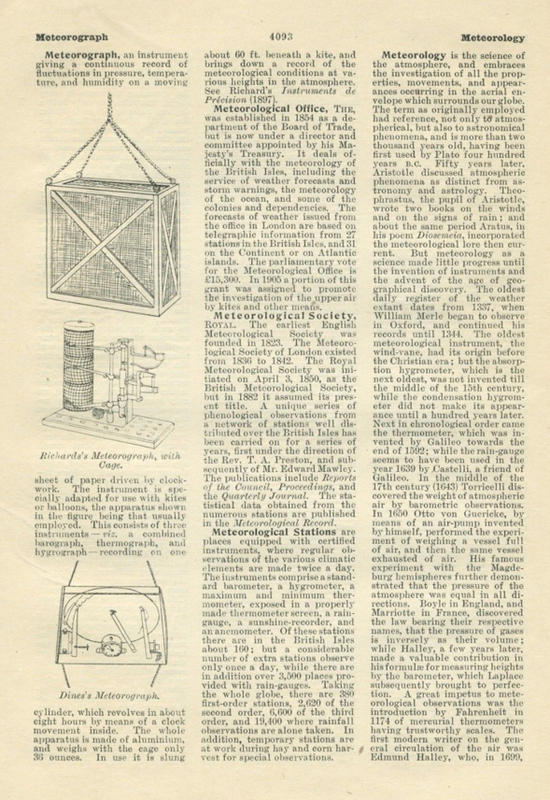 1921 Handbook of Meteorology John Wiley & Sons Jacques W. Redway 294 Mention of flights by "manned balloons, captive balloons, pilot balloons, and sounding balloons" and of high-air thermographs "secured to kites or balloons." 1922 The New Air World, The Science of Meteorology Simplified Little, Brown, and Company Willis Luther Moore 326 By the former head (18 years) of the U.S. Weather Bureau. Talk of "the use of kites and balloons in sending automatic meteorological instruments far aloft." 1924 Flugzeug-Meteorographen Reprint from "Precision and Accuracy" (Feinmechanik und Präzision) Professor Dr. A. Wigand Halle a.S. 16 In German. Description, line drawings, and photo of the aircraft-borne meteorograph. 1925 Aeronautical Meteorology The Ronald Press Company Willis Ray Gregg 144 Notes pilot balloons have been observed above 15 kilometers. Three copies. 1926 Meteorological Observer: Students Manual for All Arms, Training Manual No. 30 U.S. Government Printing Office United States Army 254 Section on day and night balloon soundings. 1926 Physiography Henry Holt and Company Rollin D. Salisbury 676 Discusses height of the atmosphere as determined by balloons and various other means. 1928 Aerial Navigation and Meteorology Self Published Capt. Lewis A. Yancey 68 "Very little reliable information is available regarding the winds of the upper regions." 1928 Meteorology Oxford University Press David Brunt 112 Mentions first use of free balloons with recording instruments in 1893. 1930 Aeronautical Meteorology The Ronald Press Company Willis Ray Gregg 405 Section on sounding-balloon meteorographs and two-balloon descent method. 1930 An Analysis of Meteorology as Related to the Operation of Aircraft Harold Lewis Kirby Harold Lewis Kirby 120 plus endpapers Description and illustration of "Aero-Meteorograph designed for use with Sounding Balloons." 1931 The Meteorology of the Free Atmosphere National Research Council Willis Ray Gregg, Leroy T. Samuels, and Welby R. Stevens 65 Includes role of balloon-borne meteorographs and photos of same, including Fergusson balloon meteorograph. Notes 80 to 90% of instruments returned. 1932 Die meteorologischen Ergebnisse der Polarfahrt des ,, Graff Zeppelin"", Juli 1931 S. Hirzel, Leipzig L. Weickmann 18 plus foldout Discussion with photo, chart, and table of radiosonde soundings taken from the Graf Zeppelin's arctic polar crossing in 1931. 1935 Instructions for Airway Meteorological Service U.S. Government Printing Office U.S. Department of Agriculture, Weather Bureau 138 Section on ceiling balloons and their inflation. Also have 1941 edition with lengthy section on code for daily transmission of radiosonde observations (RAOB). 1936 On the Return of the Aerological Instrument International Meteorological Organization Dr. Ludwig Weickmann 29 In German. Contains a radiosonde-return card printed in each language of the IMO. With cover letter, shown here. 1937 Basic Aeronautical Meteorology Boeing School of Aeronautics, Oakland B. C. Haynes (Howard B. Kaster text revised) 160 Notes that sounding balloons carrying self-recording instruments and parachutes have reached altitudes of 22 miles. 1937 Synoptic and Aeronautical Meteorology McGraw-Hill Horace Robert Byers 279 Passing mentions of balloons in aerology and upper-air data collection. 1937 Weather Elements Prentice-Hall Inc. Thomas A. Blair 401 Section on radio-meteorographs. Also have 1942 and 1948 editions. 1937 Weather Rambles Williams & Wilkins Humphreys, W. J. 265 A brief discussion of the role of sounding balloons in exploring the atmosphere. 1938 Physics of the Earth, III, Meteorology National Research Council of the National Academy of Science Subsidiary Committee on Meteorology 289 Discusses balloon meteorographs with photographs (see my Old Photographs, 1930 and 1931). 1938 Weather Whittlesy House Gayle Pickwell 170 Mentions pilot balloons as well as a daily "special aircraft flight" to 20,000 feet with a meteorograph. 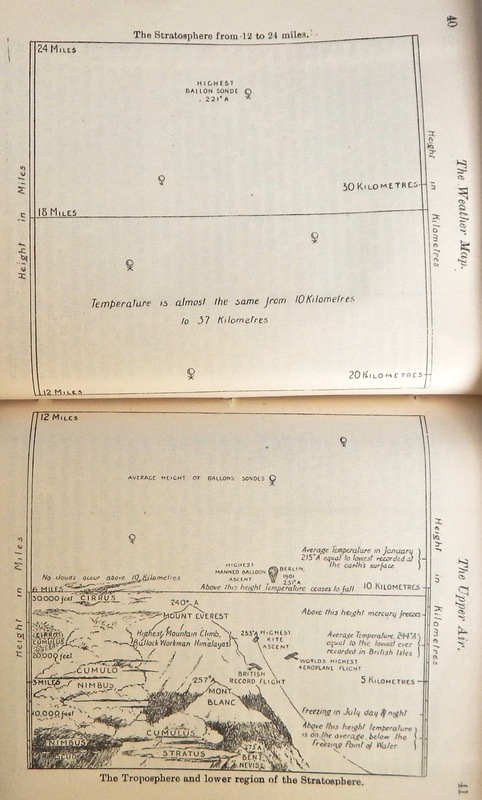 1938 Through the Overcast Funk & Wagnalls Assen Jordanoff 356 Wonderful line drawings of the components of the Frieze Radio Meteorograph and of a 'sonde in flight. 1939 Hurricanes into New England; Meteorology of the Storm of September 21, 1938 The Geographical Review Charles F. Brooks 10 Hardbound offprint of Geographical Review article; argues for extending the network of radiometeorograph stations. 1939 The Meteorological Glossary, 3rd ed. London: Her Majesty's Stationery Office Air Ministry, Meteorological Office 251 Entries for radio-sondages (radio-soundings), with history, and radio-sondes. I also have 1951 and 1959 reprints (253 pp). 1939 The Weather Map, an Introduction to Modern Meteorology, 3rd. Ed. His Majesty's Stationery Office Air Ministry Meteorological Office 86 1941 reprint. Notes the importance of obtaining upper-air sounding information "by airplane or balloon" to make a weather map that is "really complete." 1940 Meteorology for Aviators Chemical Publishing Co., Inc. R. C. Sutcliffe 274 plus addenda Discusses use of radiometeorographs with balloons as "undoubtedly the method of the future." Also 1948 reprint by His Majesty's Stationery Office. 1940 Meteorology for Pilots. Civil Aeronautics Bulletin No. 25 U.S. Government Printing Office B. C. Haynes 167 Section on upper air soundings with photograph of unassembled Diamond-Hinman radiosonde. Two copies, plus 1942 second edition (two copies), and 1943 printing of second edition. 2nd ed. has 246 pages plus foldout maps and no radiosonde photo. 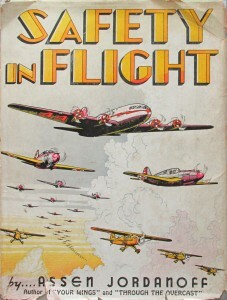 1940 Ground Instructors Manual. Civil Aeronautics Bulletin No. 30 U.S. Government Printing Office Unknown 51 Brief mention of value of radiosonde data. 1940 The Drama of Weather Cambridge University Press Shaw, Sir Napier 307 Brief history of upper air exploration with photograph of launch and recovery of sounding balloon. 1940 Weather Forecasting U.S. Government Printing Office George S. Bliss, U.S. Department of Commerce, Weather Bureau 36 Brief discussion of "radiometeorograph, or radiosonde . . . robot reporter." 1941 A Pilot's Meteorology D. Van Nostrand Company Charles Greham Halpine 220 + inserts Section on radiometeorograph (radiosonde) with photographs. 1942 and 1943 printings. Also have 1970 3rd. ed. with Malcolm W. Cagle, no photographs. 1941 Aeronautical Meteorology Pitman Publishing Company George F. Taylor 455 Section on radio meteorographs with photograph and diagrams of California Institute of Technology model. Two copies. 1941 Air Navigation and Meteorology The Goodheart Willcox Company Capt. Richard Duncan 297 Mention of Weather Bureau Stations taking upper-air observations using radiosondes. 1941 Flying Questions Pennysaver Co. Carlton L. Wheeler 42 Examination questions and answers in meteorology for pilots, brief mention of radiosondes and upper-air observations. 1941 Introduction to Meteorology McGraw-Hill Sverre Petterssen 236 Section on the radiometeorograph and radio sonde, with photograph. Replaced in 1958 edition with brief section on radiosondes. 1941 Instruction to Marine Meteorological Observers U.S. Government Printing Office U.S. Department of Commerce, Weather Bureau 114 Glossary definition of meteorographs. 1941 Meteorology The Blakiston Company Donald S. Piston 233 Photo of Frieze meteorograph in flight and obtuse explanation of operation. 1941 Meteorology, Examination Questions and Answers Carlton L. Wheeler Carlton L. Wheeler 64 Three questions on radiosondes. 1941 Reports of the Greenland Expeditions University of Michigan Press, William Herbert Hobbs, Ed. 54 Data and methodology for pilot-balloon observations. 1941 Safety in Flight Funk & Wagnalls Assan Jordanoff 371 List and map of radiosonde observation stations in the U.S. (35). 1941 Temperature, Its Measurement and Control in Science and Industry Reinhold Publishing Corp. Various 1362 Papers presented at a 1939 American Institute of Physics Symposium. Paper by C. Harmantas titled "Upper Air Temperatures Obtained By Use of Radiosonde," with photographs and schematics. 1941 Instructions for Airway Meteorological Service U.S. Government Printing Office U.S. Department of Commerce, Weather Bureau 202 plus end paper 18-page section of code for daily transmission of radiosonde (ROAB) and Airplane (APOB) weather observations. 1942 A Start in Meteorology The Norman W. Henley Publishing Company Armand N. Spitz 95 Section on radiosondes with simple line drawing. 1942 Elementary Meteorology McGraw-Hill Finch, Trewartha, Shearer, and Caudle 301 Section on radio-meteorographs/radiosondes includes photograph of radiosonde and ancillary equipment (see my Old Photographs, 1938). Also have 1943 and 1944 copies. 1942 Instructions to Marine Meteorological Observers U.S. Government Printing Office U.S. Department of Commerce, Weather Bureau 114 Mentions meteorographs carried aloft by free balloons. 1942 Meteorology National Aeronautics Council, Inc. Louis P. Harrison 314 Lengthy discussion with photos and chart of Diamond-Hinman radiosonde and its use. Two copies. 1942 Meteorology for Ship and Aircraft Operation Cornell Maritime Press Peter E. Kraght 373 Section with diagram on the radio sonde. Also have 1943 edition. 1942 The Observer's Book on Meteorology Chemical Publishing Co. Inc. William Alexander and W. J. D. Allan 110 Brief description of sounding balloons using wireless transmitters. 1942 Ways of the Weather The Jaques Cattell Press W. J. Humphreys 400 Brief discussion of "Molchanov's radiosonde as a "meteorological milepost." 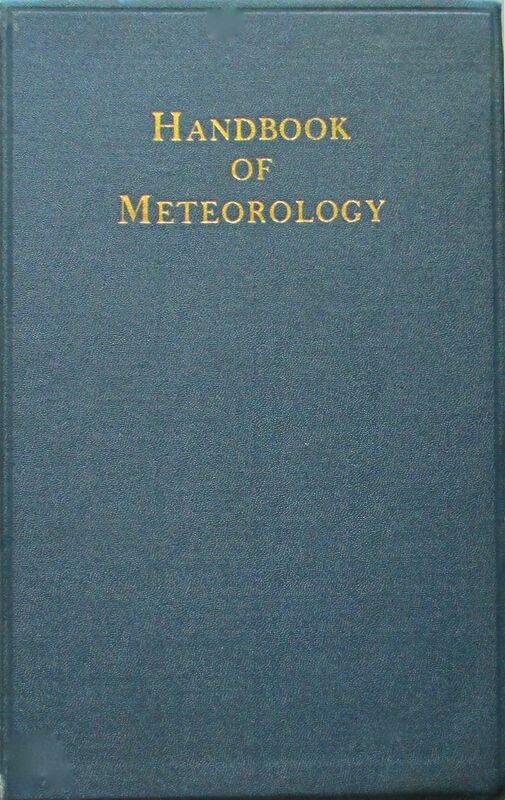 1942 Weather, an Introductory Meteorology Oxford University Press W.G. Kendrew 96 Describes pilot balloons "90 inches" in circumference. Credits free balloon use in discovering stratosphere. 1942 Basic Principles of Weather Forecasting Harper and Brothers Victor P. Starr 299 Cites value of radiosondes in forecasting by noting the elevation of the tropopause. 1942 The Upper Air Station of The Central Stations of Payerne Meteorological Facilities And New Methods of Swiss Radiosonde Information Swiss Central Station of Meteorology Jean Lugeon 46 In French. Subject as described in title. Numerous line drawings and glossy photos of radiosondes and related equipment. Inscribed by the author. 1943 Aerology for Pilots Bureau of Aeronautics, U.S. Navy Lt. J. N. Carls & Lt.JG. W. L. Mitchell 109 Discussion of radiosonde's use in upper-air soundings and line drawing of radiosonde, balloon, and parachute. 1943 An Introduction to Weather and Climate McGraw-Hill Glen T. Trewartha 545 + maps & charts Brief mention of radiosondes as instruments of weather forecasting. 1943 Meteorology, Modern Aeronautics Activity Text American Education Press, Inc. Editors of Current Aviation 64 Discussion and photographs of radiosondes and Teacher's Answer Key insert. Two copies. 1943 Subsidence Within the Atmosphere Harvard University Press, Blue Hill Meteorological Observatory Jerome Namias 61 plus foldouts Extensive use of data from "aerological soundings" with aircraft-borne meteorographs. 1943 circa Notes for the Course in Auxiliary Charts and Diagrams Department of Weather, Weather Forecasters Division, AAFCTTC, Chanute Field Enlisted Weather Forecaster Division 67 plus inserts and charts Discusses radiosonde role in upper air observations and notes 60 North America RAOBs stations as of October 1943. 1944 Aerology (two volumes) U.S. Government Printing Office Bureau of Naval Personnel 336/296 Lengthy section with photos and diagrams on using Raysondes for upper-air observations. Excellent cover graphic. 1944 Descriptive Meteorology Academic Press, Inc. Hurd C. Willett 310 Discusses value of radiometeorographs and free balloons for obtaining data in the stratosphere, includes chart derived from "raobs and pibals." 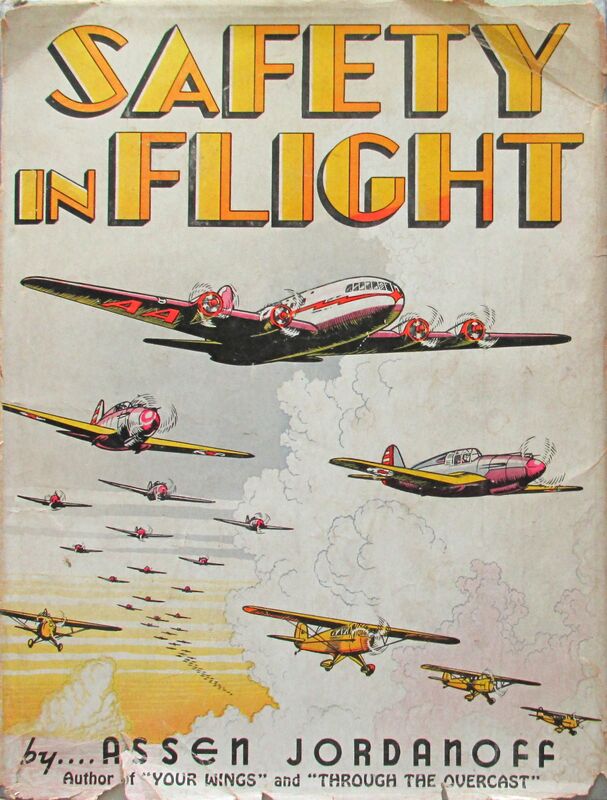 1944 Flight: Meteorology, Aircraft Instruments, and Navigation American Technical Society Capt. Bailey Wright, W.E. Dyer, and Rex Martin 415 Photograph of radiometeorograph balloon launch, and discussion of radiosondes. 1944 General Meteorology McGraw-Hill Horace Robert Byers 645 Section on development and current state of radiosondes with photographs. Also have 4th edition, 1974 (461 pp) with newer photographs. Two copies. 1944 Teach Yourself Meteorology Hodder and Stoughton Ltd. "Aeolus" 138 plus endpapers Discussion of radio meteorographs and radiosondes and an automatic ballast jettisoning system. 1944 The Review of Scientific Instruments American Institute of Physics Gaylord P. Harnwell, ed. 552 plus endpapers Contains "A Cosmic-Ray Radio Sonde" by Neher and Pickering, with photograph and schematics and a review of Middleton's "Meteorological Instruments." 1944? Meteorology Roy Publishers "Aeolus,"[psued. for Edward Gick Richardson] 167 Discussion of radio meteorographs and radio sondes. 1944? Meteorology Theoretical and Applied John Wiley & Sons, Chapman & Hall Ltd. E. Wendell Hewson and Richmond W. Longley 468 Brief descriptions of radiosondes and their role in forecasting, and examples. Tephigram in pocket part. Also have 1969 printing. 1945 Handbook of Meteorology McGraw-Hill, Maple Press Company Berry, Bollay, & Beers 1068 Entry on radiosonde equipment with diagrams, charts, and schematics, and entry on techniques of using radiosonde observations.Two copies. 1945 Meteorology for Pilots McGraw-Hill Robert W. Mudge 259 Description of radiosondes and their role in creating pseudo-adiabatic diagram. Adiabatic diagrams in pocket part. 1945 Wings and the Weather Pitman Publishing Corp. A. L. Chapman, Raymond Fletcher, and C. C. Maxey 188 Definition of radiosonde and RAOBS, woodcut of aerometeorograph. 1945 Rocket Research The Pen-Ink Pub. Co. Constantin Paul Lent 98 plus endpapers Discussion of use of rockets in meteorology, includes photos of a Fergusson balloon meteorograph and a Jaumotte micro-meteorograph. 1946 An Introduction to Electronics The MacMillan Company Ralph G. Hudson 97 Section on technical operation of radiosondes and photograph of launch. Describes two-balloon recovery technique. Three copies. 1946 Meteorology for All Barnes & Noble, Inc. R. Irving Kohn 162 Section on radiosondes, with chart. 1947 Meteorology for Airmen Pan American Navigation Service Charles A. Zweng 231 Section on upper-air soundings with two photos of Diamond-Hinman radiosonde and launch. Also author-inscribed 1964 293-page 3rd ed. 1947 Techniques of Observing the Weather John Wiley & Sons, Chapman & Hall Ltd. B. C. Haynes 272 Sections on radiosonde and rawinsondes and their appurtenances with photographs, diagrams, and schematics. 1947 Here Is The Weather Forecast Golden Galley Press LTD. E. G. Bilham 220 Chapter on radiosondes with photos. Max ascent (not launch) timed for 00, 06, 12, and 18 hours GMT. Credits Idrac and Bureau as inventors. 1947 Drought, it’s Causes and Effects Princeton University Press Ivan Ray Tannehill 264 Two good photographs of radiosonde launches. 1948 Manual on Meteorological Devices Military Publishing House of the Ministry of Defense, USSR Unknown 375 In Russian. Chapter on comb-type radiosondes with engravings, figures, charts, and tables. 1948 Meteorology for Naval Aviators NAVAER 00-80U-24 U.S. Government Printing Office Office of the Chief of Naval Operations about 320 (chapter numbering) Section with photos on radiosondes and arowagrams: "65 stations" in the U.S. Also have a copy of the 1958 edition. 1948 Meteorological Data for Little America III U.S. Department of Commerce, Weather Bureau Arnold Court 150 Supplement No. 48 to Monthly Weather Review, covering 189 radiosonde observations made 1939-1941, "first successful use of radiosondes during the Antarctic winter." 1949 Junior Aviation Meteorology University of the State of New York and Bureau of Industrial and Technical Education Corporate 115 No reference to radiosondes but specifies blond hairs for hygrometers. (see Feb 1944 Radio News). 1949 See How It Works Odhams Press Ltd. Various 384 Article on Radio Sonde, with photographs and line drawings. Two copies. 1949 The Atmospheres of the Earth and Planets University of Chicago Gerard P. Kuiper, ed. 366 plus end plates Radiosonde data from a 1939 voyage from Finland to Argentina, and illustrated article (E. Durand) on Naval Research Lab rocketsonde research. 1949 The Thunderstorm, Report of the Thunderstorm Project U.S. Department of Commerce, Weather Bureau Horace R. Byers (director), Roscoe R. Braham, Jr. (senior analyst) 287 Detailed section on radiosonde equipment and procedures including W-sonde runs. Two copies. 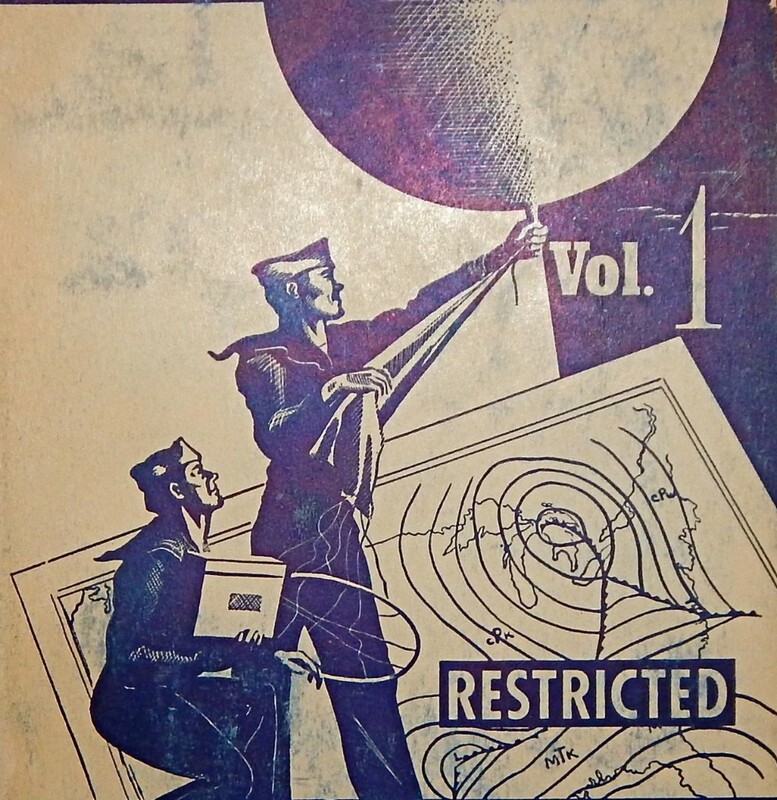 1950 Meteorology for Seamen Brown, Son & Ferguson Cdr. C. R. Burgess 252 Description of radiosondes and photograph of a ship launch. 1950 The Science of Weather London: Her Majesty's Stationery Office D. Chilton 32 Pamphlet for exhibition marking 100th anniversary of the Royal Meteorological Society. Photograph of radiosonde launch. 1950 Hurricanes Princeton University Press Ivan Ray Tannehill 304 Erroneous history of balloon-borne recording meteorographs. Speaks of “astonishing results” achieved with radiometeorographs/radiosondes. 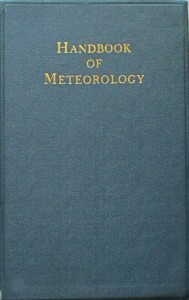 1951 Compendium of Meteorology American Meteorological Society Thomas F. Malone, ed. 1,334 Article with photographs on radiosondes, parachute radiosondes (dropsondes), and wire sondes. 1951 Meteorology with Marine Applications McGraw-Hill William L. Donn 465 Photograph of AN/AMQ-1 Friez radiosonde with Electric Hygrometer Element. Ephemera from William R. Liebschner, M. D. Three copies, one with author's dedication. 1952 On the Comparison of Radiosonde Data in Payerne May 1950 Kung, Boktryckeriet, P. A. Norstedt & Soner, Stockholm Alf Nyberg 22 Six types of radiosondes from 10 countries compared in side-by-side testing. 1953 All About the Weather Random House Ivan Ray Tannehill 148 Children's book discusses radiosondes with drawings (including an AN/AMQ-1). 1954 Radiosonden Veb Verlag Technik Berlin Dr. Paul Beelitz 136 In German. 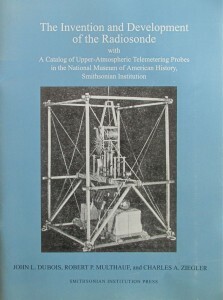 Book covers radiosondes and related equipment, with photographs and drawings and extensive bibliography. 1954 Sun, Sea and Sky J. B. Lippincott Company Irving P. Krick and Roscoe Fleming 248 Two mentions of radiosondes. Book inscribed to L. Wilson Ruid by Krick and signed by both Krick and Fleming. 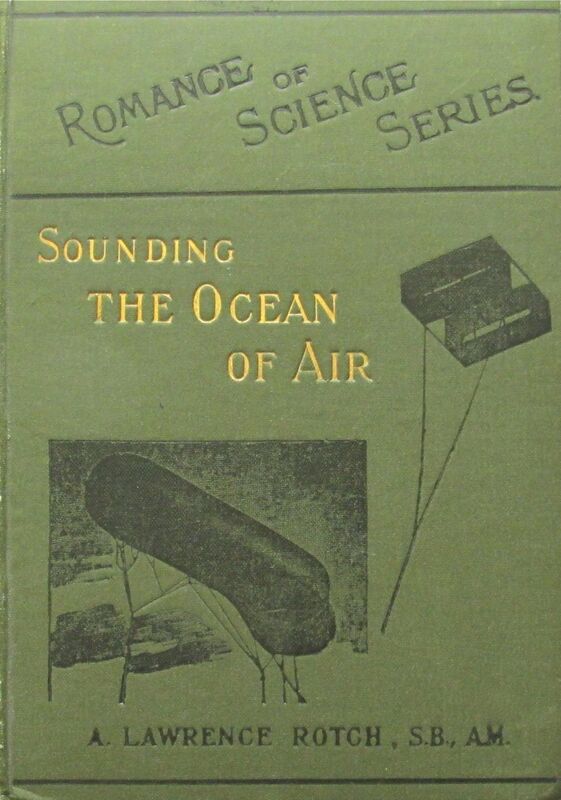 1954 Song of the Sky, an Exploration of the Ocean of Air Houghton Mifflin, Riverside Press Guy Murchie, Jr. 438 Describes radiosondes as "manmade question marks that rise humbly toward heaven as if to inquire of God His will for today and tomorrow." 1954 Further Outlook Allan Wingate F. H. Ludlam and R. S. Scorer 174 Notes tradeoff between accuracy and expense in using radiosondes. 1954 Tropical Meteorology McGraw-Hill Herbert Riehl 392 Enumerates the inadequacies of radiosondes in the tropics. "Standardization is urgently needed." 1955 Aerographer's Mate 3&2 Bureau of Naval Personnel U.S. Government Printing Office 419 Sections with photographs and line drawings on radiosonde observations and radiosonde equipment. 1955 Meteorology and Atomic Energy AECU 3066 U.S. Atomic Energy Commission U.S. Department of Commerce, Weather Bureau 169 Discusses the shortcomings of radiosondes for AEC purposes. 1955 Our American Weather McGraw-Hill George H. T. Kimble 323 Paragraph discussion of the history and use of radiosondes. 1955 Principles of Meteorological Analysis Dover Publications, Inc. Walter J. Saucier 438 1951 map of names and numerical indices of U.S. radiosonde stations. 1955 Your Weather Service London: Her Majesty's Stationery Office The Meteorological Office 52 Pamphlet. Discussion of upper-air observations and two radiosonde photographs. 1956 A Mariner's Meteorology D. Van Nostrand Company Inc. C. G. Halpine and H. H. Taylor 371 Section on "radiometeorographs or radiosondes" and photographs of radiosonde in flight and a recorder. Two copies. 1956 Observer's Handbook Her Majesty's Stationery Office Meteorological Office 221 plus advertising endpapers Lengthy discussion of methods to ascertain cloud base heights with pilot balloons. 1957 Atmospheric Electricity Pergamon Press J. Alan Chalmers 327 Mentions radiosondes rather than altielectrographs being used to measure atmospheric electricity. 1957 Dynamic Meteorology and Weather Forecasting American Meteorological Society and Carnegie Institution Godske, Bergeron, Bjerknes, and Bundgaard 800 History of upper-air observations and of the incorporation of radiosonde data into weather analysis and forecasting. 1958 Meteorology for Naval Aviators NAVAER 00-80U-24 CNO Aviation Training Division U.S. Navy Several hundred (section numbering) Discussion of radiosondes and arowagram charts; photo of radiosonde recorder and photo and line drawing of radiosonde launches. 1958 There's Adventure in Meteorology Popular Mechanics Neil P. Ruzic 166 Explains radiosondes and dropsondes and other meteorological equipment. 1958 The Upper Atmosphere Hutchinson of London H. S. W. Massey and R. L. F. Boyd 333 1960 rev. ed. Section on balloons for research, also discussion and photos of rockoons. 1958 Introduction to Meteorology McGraw -Hill Sverre Petterssen 236 Second ed. Brief discussion of radiosondes. 1959 Danny Dunn and the Weather Machine McGraw-Hill Jay Williams and Raymond Abrashkin 144 Children's illustrated (b&w drawings) learning book premised on a boy finding a radiosonde. 1959 Introduction to Theoretical Meteorology Krieger Publishing Company Seymour L. Hess 364 1979 reprint. Describes the radiosonde as the principal instrument of upper-air soundings and explains how the various parameters are calculated. 1959 Glossary of Meteorology American Meteorological Society Ralph E. Huschke, ed. 638 Definition of radiosonde, and listing of types. 1959 Dynamic Meteorology and Weather Forecasting American Meteorological Society and Carnegie Institution C. L. Godske, T. Bergeron, J. Bjerknes, and R. C. Bundgaard 800 History of aerological synoptics ascribing the first radiosonde to W. R. Blair in U.S. in 1923. 1960 Handbook of Aviation Meteorology Her Majesty's Stationery Office Air Ministry Meteorological Office 395 plus end papers. Explains the function and purpose of "radiosondes" in upper-air observations, notes current British model uses goldbeater's skin for humidity. 1960 The Observer's Book of Weather Frederick Warne & Co. Reginald M. Lester 152 Discussion of the role of the "radiosonde" in forecasting. Four launches per day from British stations. Glossy plate photo of radiosonde launch. Two copies. 1960 Understanding Weather Pelican Books O. G. Sutton (Sir Graham) 215 plus end papers History of radiosondes, current British radiosondes described, and need for more accurate instruments. 1961 Aeronautics and Astronautics: An American Chronology of Science and Technology in the Exploration of Space, 1915-1960 NASA Emme, Eugene M. 240 Note of 1936 Navy endorsement of radio meteorographs and first Navy regular use in 1938. 1961 Handbook of Meteorological Instruments; Part II, Instruments for Upper Air Observations London: Her Majesty's Stationery Office Air Ministry, Meteorological Office 209 Chapters, with photographs and diagrams, on Principles of Radio-Sonde Design; Meteorological Office Radio-Sondes, and Radio-Sonde Calibration, Balloons and Accessories. Ad for Beritex Seamless Balloons in endpapers. 1961 Meteorology for Glider Pilots John Murray C. E. Wallington 302 Discussion and graphics of radio-sondes and their use. 1961 The Challenge of the Atmosphere Greenwood Press Sir Graham Sutton 231 Discusses the role of radiosonde in soundings and forecasting. 1961 Tables for Computing Horizontal Distance of Pilot Balloons (100 Gram) U.S. Government Printing Office Weather Bureau 181 For computing the horizontal component of the balloon's distance from the theodolite at any minute (up to 90) after balloon release. 1961 Maritime Meteorology The Maritime Press, London G. E. Earl and N. Peter 122 Brief description of the "radio-sonde." 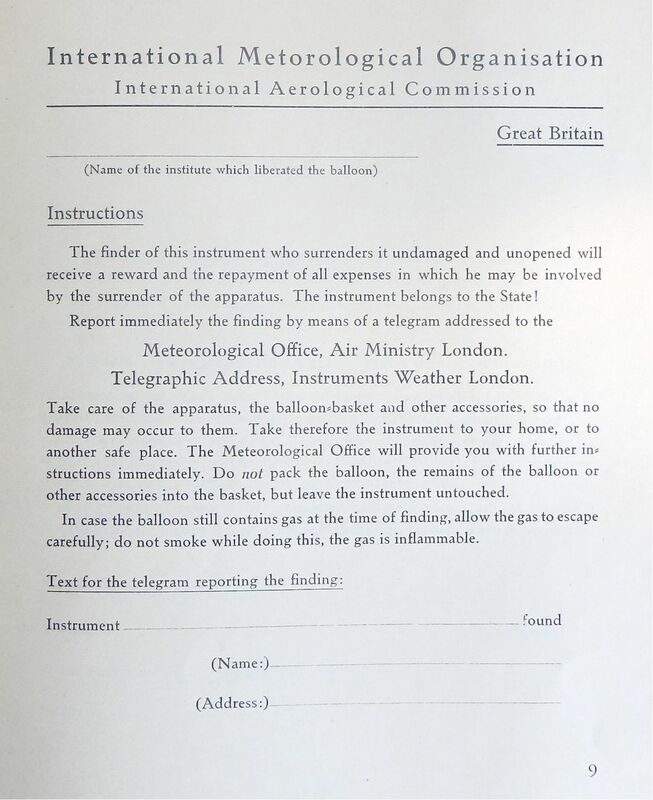 1962 Elementary Meteorology London: Her Majesty's Stationery Office Meteorological Office 189 Mention of radiosondes as a tool in measuring the vertical temperature structure. 1962 Weather in Your Life Dennis Dobson, London Irving Adler 127 Description of radiosonde and it's role, glossy photo of radiosonde launch from a weather ship. 1962 The Ladybird Book of the Weather Wills & Hepworth Ltd. F. E. Newing and Richard Bowood 51 Child's book, one nice color illustration of a PIBAL tracking team. 1962 Aerology Hydrometeorological Publishing House Vasilii Alekseevich Belinksy 220 ""Approved by the Ministry of Higher and Secondary Specialized Education of the USSR as a textbook for students in hydrometeorology schools." Many radiosonde photos, drawings, schematics, charts, etc. 1962 (1977 printing) A Course in Elementary Meteorology Her Majesty's Stationery Office Meteorological Office, D. E. Pedgley 189 Brief discussion of "radio-sonde" readings taken twice a day around the world. 1963 Directions for the Use of Artillery Instruments, Radiosonde H50 (Graw Model) Chief of the Imperial General Staff The War Office [Britain] 49 Discussion w/photographs, drawings, and charts of the preparation, launch, recording, evaluation, and maintenance of the Graw H50. 1963 The Happy Hollisters and the Castle Rock Mystery Doubleday and Company, Inc. Jerry West 174 Kids story in which a radiosonde figures prominently. Several line drawings of radiosondes, balloons, parachutes. 1963 Weather, Boy Scouts of America Merit Badge Series Boy Scouts of America Boy Scouts of America 60 Section on radiosondes. & Banner I. Miller 377 Notes that beginning in 1937 a radiosondes network provided "upper-level steering data"; states that PIBALS useful to 25,000-30,000 feet. Two copies. 1964 Meteorology for Airmen, 3rd Ed. Pan American Navigation Service Charles A. Zweng 293 Signed copy. Mentions radiosonde among "weather observing instruments and equipment." 1964 Meteorological Observations Above 30 Kilometers NASA Scientific and Technical Information Division John E. Masterson, Sidney Teweles, William Nordberg 57 Three papers on observations made above 100,000 feet with sounding rockets. 1965 Meteorological Satellites and Sounding Rockets U.S. Government Printing Office NASA 34 Soft cover publication with section on the history of small sounding rockets including ARCAS photo. 1965 Meteorology McGraw-Hill William L. Donn 484 Third edition. Photos of Friez radiosonde and shipboard launch, and description of radiosondes as 'the basis of modern weather analysis. Also have 1975 fourth ed. with different radiosonde photos. 1965 The Upper Atmosphere, Meteorology and Physics Academic Press Richard A. Craig 509 Sections on balloon sounding systems, radiosondes, and sounding rockets. Discusses some inherent biases of radiosonde observations. Two copies. 1965 Weather Eyes in the Sky The Ronald Press Company J. Gordon Vaeth 124 Section on radiosondes and radar, includes photograph of man with "Molchanov-type balloon" (see my Old Photographs 1930s). Two copies. 1966 Manual of Meteorology Bureau of Meteorology, Australia W. J. Gibbs, Issuer 168 Examples of aerological diagrams produced from radiosonde flights. 1966 Radio Meteorology U.S. Department of Commerce, National Bureau of Standards B. R. Bean and E. J. Dutton 435 Extensive references to radiosondes as data sources used in determining the refractive index of the atmosphere and related phenomenon. Two copies. 1967 Exploring Earth and Space, 4th. Ed. McGraw-Hill Margaret O. Hyde 160 Describes the "radiosonde (ra' di-o-sond')" as "lunch box" sized. 1967 Watching for the Wind Doubleday Anchor James G. Edinger 148 Mentions WWII radiosonde network in L.A. Basin to study fog and stratus clouds. 1968 Weather Instruments, How They Work G. P. Putnam’s Sons. Irwin Stambler 96 Explanation and photos of radiosondes as well as the transosonde. Two copies. 1969 Catalog of Meteorological Instruments in the Museum of History and Technology Smithsonian Institution Press W.E. Knowles Middleton 129 Chapter on radiosondes, same photographs as DuBois, Multhauf, and Ziegler. Two copies. 1969 The Invention of the Meteorological Instruments Baltimore, the Johns Hopkins Press W. E. Knowles Middleton 362 Chapter on telemeteorography and the radiosonde. 1970 Elements of Meteorology Charles E. Merrill Publishing Co. Albert Miller and Jack C. Thompson 402 Discussion with photos of radiosondes and a map of the world radiosonde network. 1970 The Practice of Weather Forecasting Meteorological Office, London P. G. Wickham, M.A. 187 1977 reprint. Discussion of use of radiosondes in upper air sounding. 1971 Guide to Meteorological Instrument and Observing Practices World Meteorological Organization World Meteorological Organization Several hundred (chapter numbering) Chapters on radiosonde techniques and meteorological balloon techniques. Also have 7th edition, 2008, with chapter on rocketsonde measurements. 1971 Meteorology Charles E. Merrill Albert Miller 154 Second edition. Brief history of upper-air soundings and radiosondes. Also have 1966 edition. 1972 Meteorological Glossary Her Majesty's Stationery Office D. H. McIntosh, Comp. 319 Description of the radiosonde and its function and components. 1973 Experiments in Meteorology Doubleday Leslie W. Trowbridge 270 Includes experiments suitable for high-school students including "Balloon Tracking of Low-Altitude Winds." 1974 Weather and Climate Modification John Wiley & Sons W. N. Hess, ec. 842 Section on radiosondes and dropsondes. 1975 Meteorological Grounding for Artillery Fire Military Publishing House, Ministry of Defence, USSR V. V. Kovalenko and V. I. Shevkunov 62 In Russian. Artwork of radiosonde on cover, interior has graphic showing radiosonde and tracking station. 1975 Doing Something About the Weather G. P. Putnam’s Sons Victor Boesen 120 Gives history of radiosondes including transosondes and Global Horizontal Sounding Technique (GHOST) balloons. 1975 (Rev.) Aviation Weather, for Pilots and Flight Operations Personnel, AC 00-6A ASA Publications (reprint) FAA & NOAA 219 Explains use of radiosondes to assist in drawing height contours. 1976 Seychelles Handbook Government Printer, Union Vale Office of the President, ed. 159 Two-page photo-spread on radiosonde release and recording at the new weather station at the airfield. 1977 Atmospheric Science Academic Press John M. Wallace & Peter V. Hobbs 467 Credits Pavel Molchanov with inventing the radiosonde in 1927. 1979 The Physics of Atmospheres Cambridge University Press John T. Houghton 203 Mentions radiosondes complemented by “sparse” network of rocketsondes taking data up to 90km altitude. 1980 Up, Up, and Away, the Story of Ballooning The Westminster Press Anabel Dean 192 Section on weather balloons with photograph of Air Force personnel launching a radiosonde. 1981 Aerological Observers Course in the Performing of Transpondersonde Observations with ADRES Transport Canada, Meteorology Training Center Unknown 53 Course in radiosonde sounding using a transpondersonde with the Aerological Data Reduction System. 1981 What Does a Meteorologist Do? Dodd, Mead, and Company Grant Compton 77 Text and photographs (including cover photo) explaining radiosondes and dropsondes. 1982 History of Meteorological Rocket Operations from the Kwajalein Missile Range Kentron Meteorological Support Group Kentron Staff 6 History with maps of rocketsonde launches from 1962-1982. 1982 Meteorology at Sea Stanford Maritime Unlimited Ray Sanderson 227 Appendix titled Radiosonde and explaining the device and its application in forecasting. 1983 Exploring the Upper Atmosphere New Zealand Meteorological Service Unknown 5 Booklet on radiosonde sounding, with photos and chart. 1984 Aerographer's Mate Third Class (Observer) Naval Education Training Command AGCM William A. Orvis and others. Several hundred (section numbering) Well illustrated sections on upper-air observation processes and equipment. 1984 Some Meteorological Aspects of the D-Day Invasion of Europe 6 June 1944 American Meteorological Society Shaw & Innes ed. 169 Proceedings of a Fort Ord Symposium. Very little upper-air-observation comments but fascinating read. 1985 Meteorology, the Atmosphere in Action, 2nd Ed. Wadsworth Publishing Joe R. Eagleman 394 Describes function of radiosondes and rawinsondes, with map of U.S. stations and radiosonde launch photo. 1986 America's Weather Warriors 1814-1985 Texas A&M University Press Charles C. Bates and John F. Fuller 360 Occasional mention, see index. 1986 Mesoscale Meteorology and Forecasting American Meteorological Society Peter S. Ray ed. 793 Article on atmospheric sounding systems with radiosonde intercomparisons and brief history. 1987 Kaltfront, Luftdruck, Wetterkarte Der Kinderbuchverlag Helmut Trettin 79 German children's weather book includes a section on radiosondes with color drawings. 1987 The Irish Meteorological Service: The First Fifty Years 1936-1986 Dublin, the Stationery Office Lisa Shields ed. 107 Discussion of the single upper-air observation station (4 releases per day) at Valentia Observatory. 1990 Marine Observer's Handbook Her Majesty's Stationery Office Meteorological Office 157 Notes that due to specialized equipment and training, radiosonde observations are not made from British merchant ships. 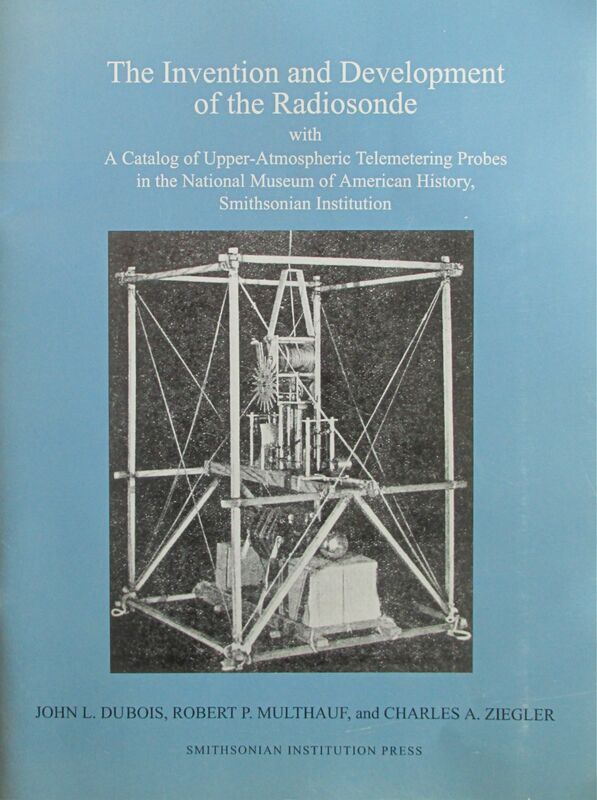 1990 The Blue Hill Meteorological Observatory: The First 100 Years 1885-1985 American Meteorological Society John H. Conover 514 Covers the history of the development of the radiosonde in this country, with photographs, graphs, charts, etc. 1990 Thor's Legions, Weather Support of the U.S. Air Force and Army 1937-1987 American Meteorological Society John F. Fuller 443 High-level survey of activities, some specifics on radiosonde systems. One sketch of a radiosonde launch under sniper fire. 1992 The Atmosphere, 5th ed. Prentice Hall Frederick K. Lutgens and Edward J. Tarbuck 430 Passing mention of radiosondes and rawinsondes. Also have 2001 8th ed. with color photo of ‘sonde under balloon. 1995 Calculating the Weather Academic Press Frederik Nebeker 255 Recounts discovery of troposphere and stratosphere, "international balloon days," tephigrams. Talks of "International Balloon Day" soundings from 1896 to 1901. 1995 How the Weather Works Reader's Digest Young Families Michael Allaby 192 Children's book, photos and line drawings explaining how radiosondes work and fit into the "global weather network." 1995 Storm Talk Self Published Tim Marshall 223 Listing of U.S. upper-air observations sites, radiosonde numerical codes. 1996 Forecasts for Flying, Meteorology in Canada, 1918-1939 ECW Press Morley Thomas 264 Mention of first use of radiosondes/radiometeorographs, use of data from "the new networks of radiosonde stations in the United States." 1996 Glossary of Weather and Climate with Related Oceanic and Hydrologic Terms American Meteorological Society Ira. W. Greer, ed. 272 Definitions of radiosonde and radiosonde-related terms. 1996 Hands-On Meteorology, Stories, Theories, and Simple Experiments American Meteorological Society Zbigniew Sorbjan 306 Brief History of Radiosondes. Lists erroneous date for Molchanov radiosondes. 1996 Memories of the Bureau of Meteorology 1929 to 1946 (and others) Metarch Papers #8, [Australian] Bureau of Meteorology Allan Cornish 92 Discussion of early types of radiosondes used by the Bureau. 1998 An Introduction to Meteorological Instrumentation and Measurement Prentice Hall Thomas P. DeFelice 229 Detailed discussion, with sensor photos, of current radiosonde system operations. 1999 Air Apparent University of Chicago Press Mark Monmonier 309 Map of U.S. Pilot-Balloon stations in 1933. 1999 A Very Special Family: Memories of the Bureau of Meteorology 1946 to 1962 Metarch Papers #13, [Australian] Bureau of Meteorology W.J. Gibbs 259 Little on radiosondes; mentions development of "pressure release valves which enabled unmanned balloons to ascend to great altitudes." 1999 Stories of the Bureau's Radio technical Officers from 1948 Metarch Papers #14, [Australian] Bureau of Meteorology Ray Clarke, Comp. 113 Numerous mentions of radiosonde soundings and photo of early radiosonde receiving equipment. Two copies. 2000 Glossary of Meteorology, 2nd Ed. American Meteorological Society Todd S. Glickman, Ed. 855 Definitions of radiosondes and related equipment. 2000 Small Sounding Rockets . . . 1955 to 1973 Small Rocket Press Richard B. Morrow and Mitchell S. Pines 536 Text, photos, and blueprints of less-than-8-inch-diameter sounding rockets, and history of the Meteorological Rocket Network (MRN). 2001 Essentials of Meteorology, An Invitations to the Atmosphere, 3rd. Ed. Brooks/Cole C. Donald Ahrens 463 plus cloud chart and CD Summary description with photo of radiosonde and rawindsonde observations. 2001 Metmen in Wartime, Meteorology in Canada 1939-1945 ECW Press Morley Thomas 360 Section on upper air observations with brief history of Canadian radiosonde. 2001 Meteorological Measurement Systems Oxford University Press Fred. V. Brock & Scott J. Richardson 290 Sections on radiosondes and radiosonde exposure errors. 2002 The Invention and Development of the Radiosonde Smithsonian Institution Press DuBois, Multhauf, and Ziegler 78 Excellent history with photographs, diagrams, bibliography of literature cited. Three copies. 2002 Datastreme Atmosphere American Meteorological Society American Meteorological Society 416 Section on the history of upper-air observations, with color photo of radiosonde launch and map of U.S. radiosonde stations. 2003 Weather Map Handbook Weather Graphics Technologies Tim Vasquez 167 Presents radiosonde observation format for data transmissions. 2003 Weather Barnes & Noble David Ellyard ed. 64 General overview of weather aimed at children with drawing and description of radiosonde. 2004 Meteorology: Predicting the Weather The Oliver Press Susan and Steven Wills 144 Presents development of radiosondes in U.S. in context of Carl-Gustaf Rossby. 2004 War North of 80 University of Calgary Press Wilhelm Dege 361 Discussion and photo of radiosonde operations, which were central to the WWII German arctic weather-data-collection program. 2005 Severe and Hazardous Weather, An Introduction to High Impact Meteorology, 2nd. Ed. Kendall/Hunt Robert M. Rauber, John E. Walsh, and Donna J. Charlevoix 558 plus CD Lengthy discussion of rawinsondes. 2006 NOAA Diane M. Stanitski & John J. Adler 42 Youth-oriented primer about NOAA hurricane hunters. Good illustrated section on dropsondes. Signed first ed. 2007 The Weather Watchers Melbourne University Publishing David Day 530 Beautifully printed history of the Australian Bureau of Meteorology with sparse mention of radiosondes. In the early 1950s, 14 stations did daily releases. 2008 Jumpstarters for Meteorology, Grades 4-8+ Mark Twain Media, Inc. Wendi Silvano 46 Questions requiring a basic knowledge of the function of radiosondes. 2008 Guide to Meteorological Instruments and Methods of Observation World Meteorological Organization World Meteorological Organization Several hundred (section numbering) Very detailed technical guide to nature and operations of radiosondes, rocketsondes, and balloons. 2012 History of the Meteorological Office Cambridge University Press Malcolm Walker 468 Numerous entries regarding the role radiosondes played in the organization's history. Photograph (un-indexed) of radiosonde launch. Two copies. 2012 Weather by the Numbers MIT Press Kristine C. Harper 308 A few references including 1925 map of weather bureau kite and balloon stations and 1944 pre-launch photo. 2015 Meteorological Instruments and Instrumentation John Wiley & Sons R. Giles Harrison 257 Gift of the author. Lengthy section on radiosondes, with color and B&W photos, charts, and graphs, plus subsection on special-purpose radiosondes. 2017 Meteorology in the Real World Abdo Publishing Gregory Vogt 48 STEM book for kids. Great cover color shot of ‘sonde launch. Description of dropsonde operation.